Origin: Curly Leaf pondweed is native to Eurasia, Africa, and Australia and was introduced to the U.S. in the mid-1800s. At this point it is unknown how it got to the United States but some assume that it was accidentally introduced with fish stocking operations. Roots: Curly leaf pondweed has an extensive rhizomatous root system allowing it to be a perennial herb. The roots tend to grow in slow-forming water and usually found in low-land areas. Stems/Leaves: Off of the roots, the herb produces a flattened branched stem that extends up to a meter long. The leaves are linear in shape and are only formed in submerged water. The leaves can be an array of colors ranging from bright green, olive green and dirt brown. The older growth leaves will have wavy edges but is not the case for newly developed leaves. Flowers: The inflorescence of this plant is a short spike that emerges above the water's surface. The flowers measure in length of about 7 cm. The plant usually flowers from June through September. Fruits and Seeds: The fruits of the plant have a prominent cone shape to them and a bumpy ridge that makes for a key identification feature of the plant. Turions which are the seeds of the plant, form in the leaf axils during the growing season. When the leaf axis breaks apart in mid-July, the turions drop and fall to the sediment where they lie dormant until the water cools off in the fall. Reproduction: Being a perennial herb, the plant reproduces and comes back year after year. It is a self-fertilizing plant and produces both seeds and turions. The plant is is resistant to disturbances such as dredging making it hard to kill. Environments Favorable to Infestation: This plant refers lowland and low elevation areas. It can only grow in slow moving water or stagnant water such as ponds or lakes. 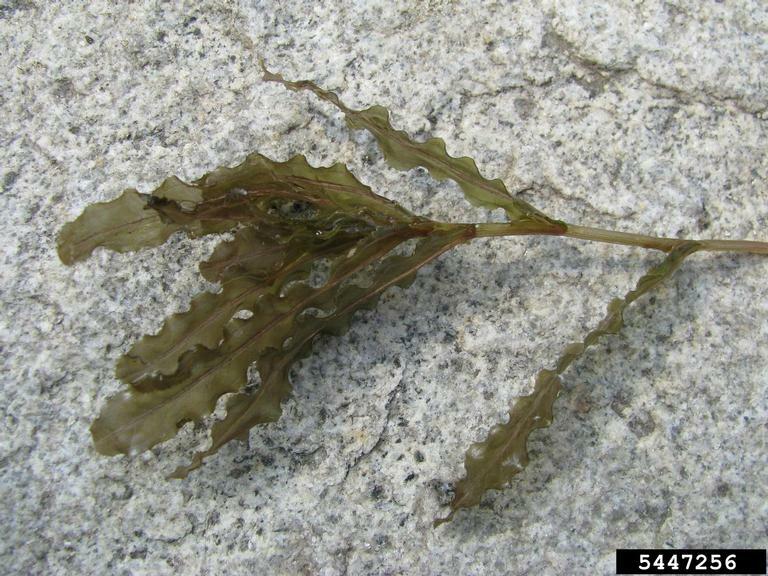 Damage: Curly leaf pondweed often times will outcompete native aquatic plant species and sometimes displace it. It will often times clog waterways and plug up watercraft engines. It very easily spreads and can enter water recreation areas. Control Methods: Mechanical methods include hand pulling but is a difficult and very time consuming task. Plants can sprout from small root fragments so hand pulling is not all that effective. Biological control includes the grass carp that will consume the plant but results are not seen for a few seasons after introduction of fish. Chemical control using aquatic herbicides can be effective when applied early before the release of the turions. Remarks: Curly leaf pondweed is found in Montana, but it is not something to cause huge concern. Like all noxious weeds, once they are established it is almost impossible to eradicate them, but is very important to keep a steady control on them. "Invasive Species: Aquatic Species - Curly Pondweed (Potamogeton Crispus)." Invasive Species: Aquatic Species - Curly Pondweed (Potamogeton Crispus). N.p., n.d. Web. 15 June 2016. "Aquacide — Aquatic Weed Control: 4 Ways to Kill Curly Pondweed. "Aquacide — Aquatic Weed Control: 4 Ways to Kill Curly Pondweed. N.p., n.d. Web. 15 June 2016. "Potamogeton Crispus." Wikipedia. Wikimedia Foundation, n.d. Web. 15 June 2016.